Former Yankees player and general manager Bob Watson is fighting kidney disease. He undergoes dialysis several times a week and is in desperate need of a transplant. In an exclusive interview with Bill Madden of the NY Daily News, the 71-year-old reveals he has turned down donations, but for good reason. Watson played 19 seasons in the Majors spending time with the Astros, Red Sox, Yankees and Braves. Dubbed “The Bull” due to his size, he retired as a player in 1984 with a .295 BA and .811 OPS. He became baseball’s first African American general manager when he took the reins of the Astros in 1993. In 1995, he would take over for Gene “Stick” Michael in the Bronx and was instrumental in crafting the 1996 championship team. Because of that ’96 team, he holds the honors of being the first African American GM to win a World Series. 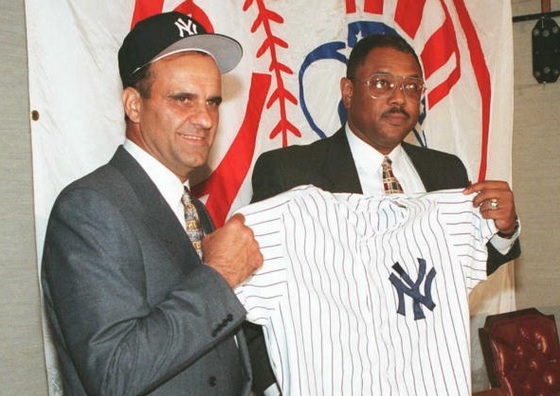 After handing over the Yankees to Brian Cashman in 1998, Watson went on to serve as vice president of on-field operations for MLB for eight years. In the role he decided on punishments for brawls, pitchers throwing at batters and other matters. The Bull spent a lifetime in the game and, despite being hooked up to a dialysis machine four and a half hours a day three days a week, wouldn’t change a thing. Watson turns 72 in April and, in his eyes, he’s had a good at-bat. “I look around and see where we just lost Oscar (Gamble) and he was only 68, and in 2009 Dave Roberts, my old roomie in Houston, died and he was just 64. So I’ve had a good count and like I said, I’ve got no complaints. I’ve lived a real good life.